Ionian Village participates in the FOCUS Backpack Program to provide 500 backpacks to Homeless Children in Orlando. With over 2 million homeless children in the United States, childhood poverty continues to be a focal point of FOCUS’ national programs. With the blessings that many of us have inherited from our youth, there is little question that children living without the proper equipment to receive an education need to be provided the resources, in order to break the cycle of poverty we see in many American communities. 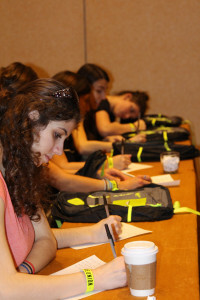 Last week, the Greek Orthodox Archdiocese of America’s Ionian Village held their annual summer camp reunion in Orlando, Florida and chose to include an aspect of service in the schedule, participating in the FOCUS Backpack Program. Officially launched in 2014, this program engages our volunteers throughout the United States by asking churches and groups to fill brand-new backpacks that are provided by us with school supplies. Through FOCUS partnerships, these backpacks are then donated to local children who are unable to afford these things on their own. Campers from the Ionian Village program took time to learn about child homelessness in the Orlando area, and then filled 500 backpacks with school supplies. The backpacks were donated to the Homeless Education Department of the Orange County Public Schools, which serves the greater area of Orlando, Florida. This department works with homeless children in their district to provide them with the educational, social, and physical resources they need to perform academically, while often living in traumatic circumstances. We thank all of our partners as we to work together to combat the ever-flowing tide of childhood poverty in our nation.